Plus, Afghanistan’s national unity government, the BJP gets strict with its members and more. Mid-week links. Pakistan, usually one of the greatest troop contributors to overseas U.N. missions, has reduced its troop commitment to U.N. multilateral operations by 32 percent over the past year. The main driver of this decrease is its domestic military campaign to stamp out militants in the country’s tribal areas. 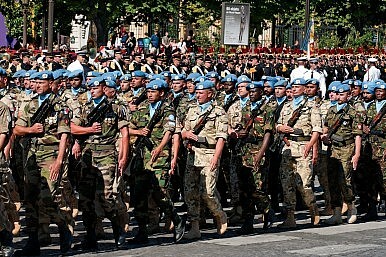 The total number of U.N. peacekeepers worldwide numbers around 98,000. According to the United Nations, Pakistan contributed 10,680 in 2009. As of the first half of 2014, it contributes just 7,203 troops. Where it once used to be the top contributor to U.N. peacekeeping missions, it is now third after Bangladesh and India. Similarly, Pakistan slipped a few places in its contribution to U.N. police missions. It went from contributing 916 personnel in 2010 to just 567 in 2014. India and Bangladesh, two other major contributors to U.N. peacekeeping efforts, were constantly reducing their commitments to the United Nations, but have started increasing their contributions since 2013. If you missed it, Srinjoy Bose offered a detailed perspective on both the April 5 general elections in Afghanistan and the subsequent run-off election on June 14 for The Diplomat. India’s new BJP government outlined a set of “dos and don’ts” for its members of parliament. The efforts highlight an attempt by the Modi government to instill a degree of discipline onto India’s new ruling party. Party members were reprimanded for tardiness at official meetings by Parliamentary Affairs Minister M. Venkaiah Naidu. “The Prime Minister was here at 9.25 am sharp. But I can see that people are still trooping in. I would urge members to take these meetings as seriously as we do,” he told a group of MPs. Also, there is a good deal of outrage in India following an incident where a member of the Hindu nationalist Shiv Sena party force fed a Muslim cafeteria worker during his Ramadan fast. The Shiv Sena is distinct from the BJP and is a regional party in Maharashtra, but it is still part of the National Democratic Alliance (NDA) coalition government. India’s opposition parties seized on the incident as an example of the religious intolerance India could face under the policies of a Hindu nationalist government. The incident has led to a broad bout of outrage within the Indian parliament.